Years ago, I was bent on cleaning up some flower beds near my front entry. and now that they had finished, I was ready to eradicate them from my yard. The dried, browned stringy leaves of the daylilies had landed in piles as I trimmed. and Lo and Behold, a NEST emerged! I created a whole bunch more, and decorated my home with them. Then I made even more, and sold them at vintage shows. and they GAVE THEM TO ME! So I made more nests. With FREE STUFF. We ALL like that, right?! 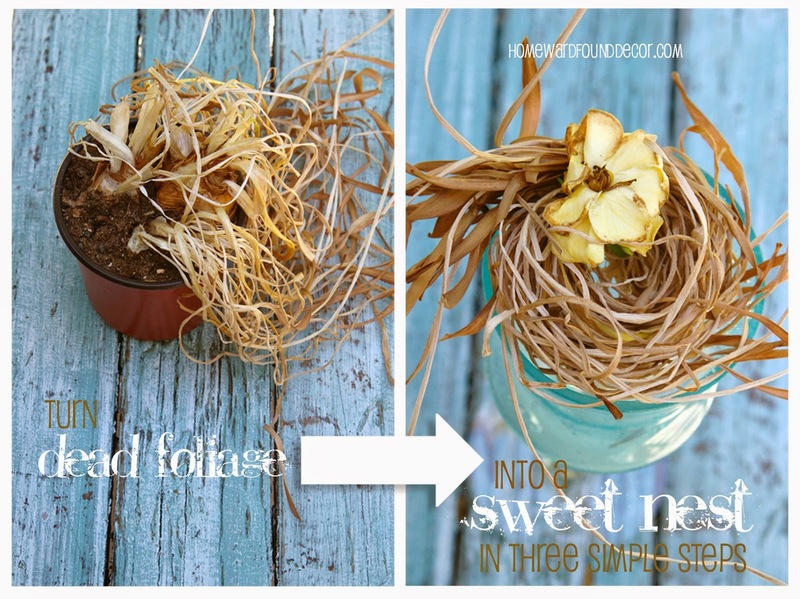 turn dead leaves into nests in just three simple steps! and cut it into a three-inch length for each nest you want to make. grab the foliage just above the bulb area, and cut there. by curling the cut ends around toward the strip. Twirl it once or twice or three times around, depending on the length of the foliage. giving a more natural appearance to it when done. to make it look more like a real one made by a bird. just like threading a needle, feed one end of the string into the hole - and then tie a knot. This will hold the nest together and keep it from unwinding. Then cut the string ends off. a tuft of moss, a fading gardenia bloom, rose petals, a precious found object. but you can attach yours with glue if you'd like. Then display your sweet nest as part of your Spring decor! while the galvanized lantern functions like a tiny house for a bird nest.